The Blessed Crows were created by Brân the Blessed. He was one of the first of the “old ones” to discover that they were immortal, under most circumstances. Unfortunately, he also found out what some of the other circumstances were, and passed away. After his death, the cauldron he created to heal people was reproduced. 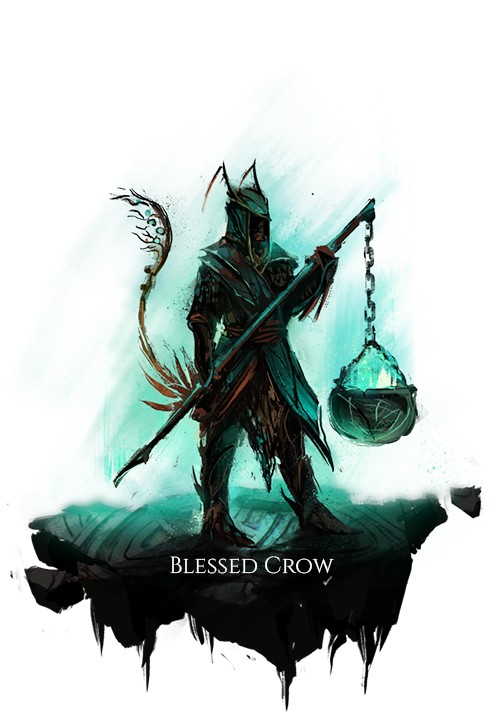 Each Blessed Crow uses their own cauldron in much the same way magic-using classes use a spellbook. By doing so, they carry on his legacy as both healers and fighters. To heal our friends and punish our enemies. Ability preparation and recovery times are increased based on the user’s total armor class. Each cauldron builds Cauldron Overflow for the amount of power used in magic abilities it is used for. Cauldron Overflow decays naturally over time, but causes the cauldron to be destroyed if an additional ability is used while it is at its maximum. The user may select one of their cauldrons as an ally target and use it as a point of origin for their offensive abilities. Consumes nearby corpses in order to restore health to nearby group members, based on the number of corpses consumed. Deals death magic to targets, also reducing their blood and stamina. A volumetric cloud, which expands over time as a channeled effect. Allows a cauldron at its maximum Cauldron Overflow to be used by this ability without being destroyed. Subsequently deals feedback damage to the user based on the power of the ability. Greatly increases the power of the next effect applied to a cauldron, and increases Cauldron Overflow to maximum for all cauldrons affected. Deals damage to the head of the user’s target based on the damage taken to the user’s head and on a portion of the overall damage suffered before death.